The Nation: Dump 'Citizens United' On Dec. 30 the Montana Supreme Court upheld a ban on corporate expenditures in state elections. The editors of The Nation urge people to support a constitutional amendment reversing Citizens United, which prohibits government from setting limits on spending in politics by corporations and unions. 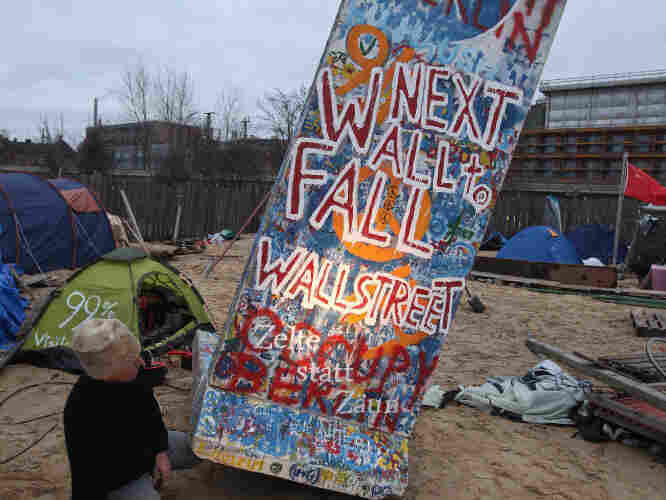 An Occupy protester tips a styrophoam, mock-section of the Berlin Wall covered with graffiti referring to Wall Street on Jan. 6, 2012 in Berlin, Germany. Opposition to Citizens United seeks to reverse the decision prohibiting limits on some campaign contributions. Written by the editors of The Nation. On Dec. 30 the Montana Supreme Court delivered a New Year's gift to the nation, upholding a century-old ban on corporate expenditures in state elections. The decision has gone underreported amid the GOP primaries — even as spending skyrockets along with growing concern about its corrosive impact (see John Nichols and Robert W. McChesney on page 11 and James Lardner on page 17). But the Montana case sets up the first direct challenge to the U.S. Supreme Court's disastrous Citizens United decision as we pass its second anniversary. Free Speech for People, a nonpartisan national campaign challenging corporate personhood rights, filed an amicus brief in the Montana case, leading a coalition that included the American Sustainable Business Council, a network of more than 100,000 businesses and social enterprises, and the American Independent Business Alliance. Jeff Clements, author of the coalition's brief, is also the author of Corporations Are Not People, in which he explains how some of the largest corporations took over our government, culminating in the Citizens United decision. He lays out a vision of how we can restore our democracy, through a constitutional amendment declaring what Clements calls "the simplest of propositions: Corporations are not people." Campaigns for constitutional amendments demand patience and tenacity, since they must secure supermajority support from both houses of Congress and then win ratification by three-quarters of the states. But as Maryland state senator and constitutional law professor Jamin Raskin says, "American citizens have repeatedly amended the Constitution to defend democracy when the Supreme Court acts in collusion with democracy's enemies, whether they are slavemasters, states imposing poll taxes on voters or the opponents of woman suffrage." Because passing an amendment is such a long haul, groups working toward that end — Public Citizen, the Center for Media and Democracy, Move to Amend, Common Cause, People for the American Way and others — would be smart to agree on language that is simple, clear and appealing. Raskin has written a letter calling for an amendment reversing Citizens United, which will be sent to the Maryland General Assembly and then to Congress. Other local jurisdictions are pursuing that strategy; the city councils of Los Angeles, Oakland, New York, Albany, Duluth and Boulder have all passed resolutions opposing Citizens United. Members of Congress, including Representatives Donna Edwards, Keith Ellison and Walter Jones, and Senators Tom Udall and Bernie Sanders, have introduced similar resolutions. But as undisclosed corporate money continues to flood our elections and drown out the voices of ordinary Americans, we should not focus solely on the amendment fight. We should bring to more states the successful public campaign financing laws already in place in Arizona, Connecticut, Maine and North Carolina. In Congress, the Fair Elections Now Act would allow federal candidates to run for office without relying on Big Money. Supporters should bring that measure to a vote. If it passes and the US Supreme Court shoots it down, that will only galvanize the people. With the Montana Supreme Court decision and growing public anger against a system devoted to serving the 1 percent, there's no better time to fight for a more democratic way. We urge everyone to support campaign finance reform and to join activists organizing for a constitutional amendment reversing Citizens United.